Adults are pretty big: bigger than a person's fist. Males tend to grow to about 2 and a half inches in length, while Females can get up to 3 - 4 inches! (thats NOT nose to toes---that's body length!) Their colors may vary but most females range from reddish-orange bright dark red. The bellies are usually more yellowish, and sometimes there are black spots on the throat. Males also tend not to be as brightly colored being a duller orange or brownish-orange. Juveniles are also dull in color and develop brighter coloration as they mature. These guys need a soft substrate to burrow into. If they start to turn an icky brown color, it's generally a sign of having a pretty unhappy frog. Try getting some potting soil with no chemicals in it....They live well in temperatures from 64 up to 80�F.. A regular terrestrial or half and half tank terrarium seems ideal housing, as long as there is something for them to burrow into. Ideally they should have about 6cm of a damp but not too wet base substrate mixture to dig into. This substrate can consist of pre-sterilized chopped oak and maple leaves, sphagnum moss and river sand, or you can go for some regular potting soil as long as it doesnt contain any chemicals..You can put a few large pieces of cork bark or bogwood on top and add a shallow water pan towards one corner. Lighting should be subdued for these frogs. You should mist the vivaria once or twice daily with de-chlorinated or stale water to retain some moisture in the substrate. All sorts of bugs and invertebrates. Crickets, waxworms, even mice! See my page on Dealing with Crickets for more info. Burrows into the ground and eats passing insects. They tend not to chase the food around but rather wait for a nearby movement. These guys are mostly nocturnal, so don't expect a lot of action during the daylight hours. When spooked, these guys can inflate their body like a baloon! The bright colors most likely serve as a warning mechanism. While not toxic, these guys can give off a yucky, sticky white mucus which is irritating to mucous membranes and may serve to ward off predators. Tomato frogs use an "ambush" strategy to hunt for food, sitting in a particular spot and eating whatever insect walks past. 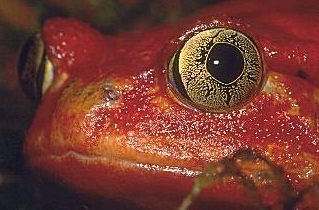 The tomato frog is found only in Madagascar and is limited to the northwest part of the island. They are primarily terrestrial, inhabiting forests areas. Their habitat is being deforested, but they apparently adapt well to living in cultivated areas and are found in gardens and eucalyptus plantations. Tomato frogs breed during rainy season in stagnant or very slow-moving water. Dyscophus antongilli is endangered in its native country as a result of deforestation and over-collecting for the pet trade. These types of Tomato frogs are protected under CITES (Convention on International Trade in Endangered Species) Appendix I and are ILLEGAL in trade! There are two other species of tomato frogs in Madagascar, D. guineti and D. insularis, neither of which are presently endangered.